Who doesn't love a solid best-of list? Our list includes some of the most popular posts on our blogs and social platforms. Turns out our followers are big fans of ocean animals, too. Earlier this year we launched a gigantic new IMAX film featuring some of the planet's most gigantic animals. Of course the post had to be gigantic! Our post announcing Humpback Whales 3D turned out to be the year's most popular. Another video post followed closely behind, not surprisingly, because flamboyant cuttlefish are entirely hypnotizing! The clip reached nearly a quarter million people. In June we announced the arrival of a fluffy penguin chick on World Penguin Day. How could you not share a post like that?! The post linked to a blog entry with the hatchday and the baby stats of our newest African penguin. 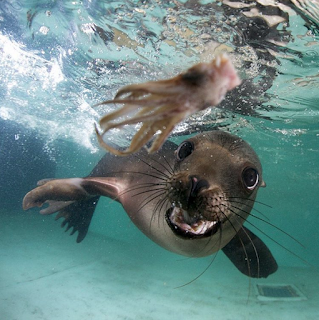 Feast your eyes on the antics of the frisky sea lions at the New England Aquarium! Little blue penguin chick behind the scenes @newenglandaquarium. Sherrie swims with one of the loggerhead #seaturtles | Professional photographer @estherhorvath visited the Aquarium to photograph the sea turtles in the Giant Ocean Tank. UPDATE: As of this week, we have a new most-popular post on Instagram! Must have been the sharks in this picture. This year's most popular blog by far brought to light the threats facing North Atlantic right whales today. 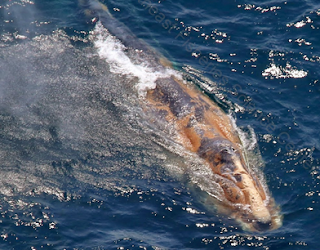 A tragic end to a favorite whale shares the story of a well-known right whale named Snowball who likely died, after being last seen with a severe entanglement in fishing line. Commander in command introduces the newest fur seal to our colony: Commander! He arrived earlier this year after a cross-country trek via FedEx. In August we celebrated Wharf Festival with our whale watch partners at Boston Harbor Cruises. It was a popular event and so, of course, the blog detailing the activities and contest involved was incredibly popular, too. 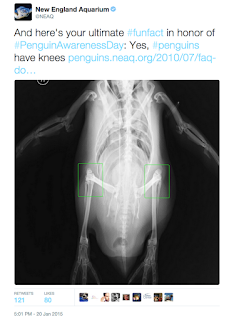 The ever-popular fun fact about penguin knees returns as our most popular tweet of 2015: And here's your ultimate #funfact in honor of #PenguinAwarenessDay: Yes, #penguins have knees . 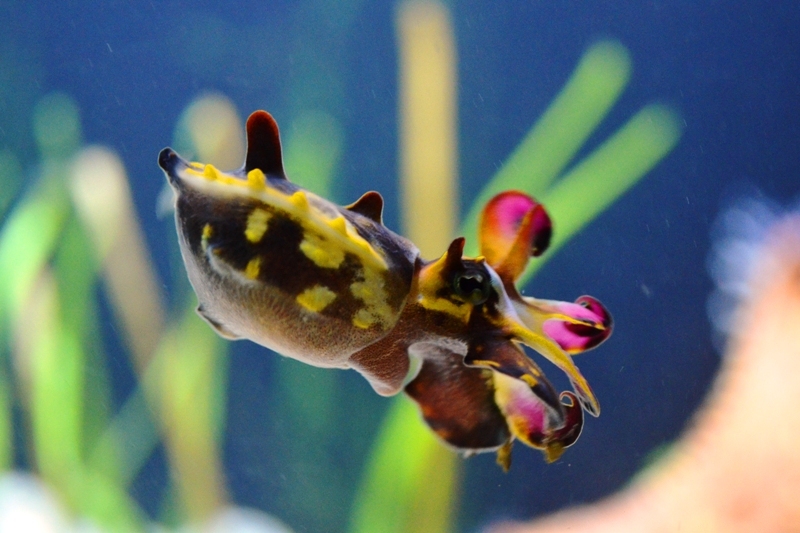 Next up, people dug the tweet we shared with a link to Science Friday's video about cuttlefish: Ooh, a cool look at raising #cuttlefish in an aquarium. An arresting picture from our whale watch was another popular tweet in our twittersphere: Wait, who is watching who on this #whalewatch? Rare whale caught on camera! 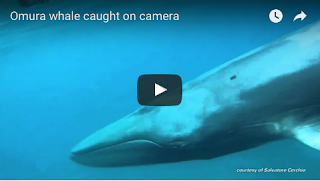 Before he joined the Aquarium, researcher Sal Cerchio caught the first-ever footage of the Omura whale on camera. He since joined the Aquariumand published a paper about this spectacular finding. Myrtle the green sea turtle, our most famous resident, lent her star power to the Aquarium's summer ad campaign with a series of TV commercials where she plays Agent Myrtle. This one was the most watched. This funky video of a hermit crab escaping the clutches of an anemone's tube feet was made all the more amusing in hyperlapse—perhaps that contributed to its popularity? Connect with us through our social media so you can be among the first to see juicy posts like these. 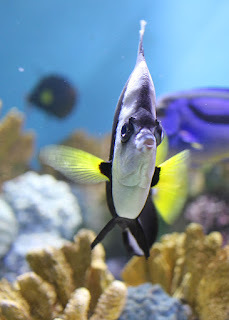 We are always sharing pictures, video and links—some posts are funny, some are sobering, some have tips for visitors, some have cute animal pictures that will stop you mid-scroll and some can transport you around our blue planet with information about our research, exploration and conservation updates. Instagram, Google + and YouTube.